There were 452 press releases posted in the last 24 hours and 153,525 in the last 365 days. The need of international expansion is substantial and is consequently resulting in an aggressive, non-organic expansion strategy overseas. LONDON, UNITED KINGDOM, May 4, 2016 /EINPresswire.com/ -- EnergyBoardroom releases the new report on the Oil & Gas sector in Indonesia! Companies, investors or other stakeholders interested in the future of energy should read how this slumbering South East Asian giant is finally poised to fulfill its hydrocarbon potential. Will President Widodo’s business-friendly reforms allow Indonesia to finally realize its huge potential? The report covers the huge optimism around Indonesian mini-LNG, deep water, shale reserves and CBM. 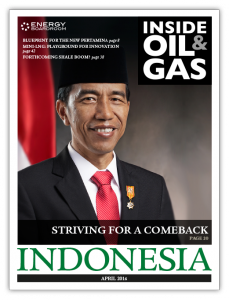 Our 16 page cover story contains crucial insights on Indonesian oil and gas and paints a picture of a country on the verge of something special. We talked to Pertamina, Migas, Ophir, Lion Energy, ENGUE, PT Schenker Petrolog Utama, Puma, ExxonMobil and many more in the public and private sectors to build a comprehensive picture of the current state of play in Indonesia. In-depth, exclusive articles tackle big issues such as the Trans-Pacific Partnership, infrastructure investment, and logistics.